If you have ever wanted to grow sweet potatoes in your garden – then today’s article is just for you! Sweet potatoes have become so much more than just a side dish for Thanksgiving. This nutritious tuber crop is now making its way on to menus everyday. And with good reason. Sweet potatoes are an excellent source of vitamin A, C, manganese, potassium and fiber. Sweet potato fries are just one of the great treats you can make from sweet potatoes. They also rank much lower on the Glycemic Index. That means they don’t spike blood sugar as much as white potatoes. And here is something else – they taste great! 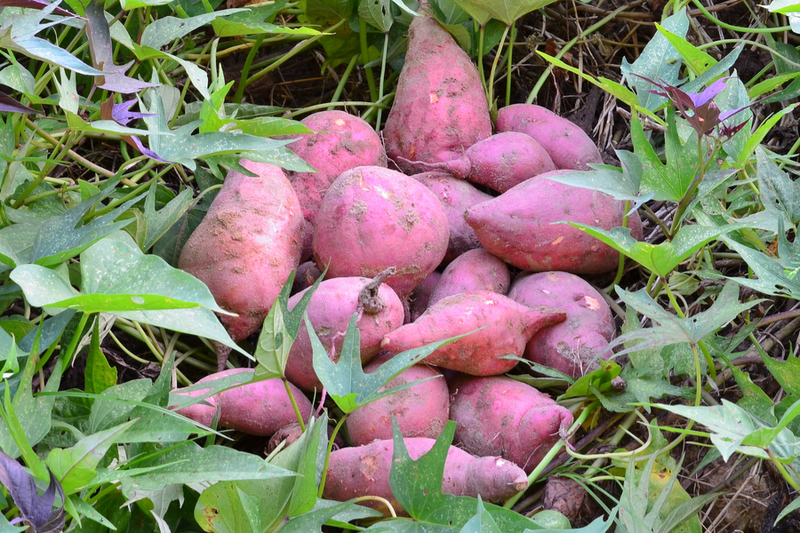 So what does it take to grow sweet potatoes in your backyard garden? Well, one thing is for sure, they grow a bit different from traditional white potatoes. Traditional potatoes are sold and planted as “seed” potatoes. To plant, you can simply chop them up with an eye or two, and place in the ground. Traditional potatoes are planted using chunks of potatoes cut up. A traditional potato grow stems and leaves from the eyes. As a result, new potato plant emerges above ground. And of course, new potatoes form underground. But to grow sweet potatoes, it is a completely different process. Instead of growing from portions of potatoes planted in the ground – sweet potatoes grow from slips. So what are slips? Slips are nothing more that a sweet potato root with a few leaves. Sweet potato slips can be made by submerging a sweet potato in water. They can be purchased, or you can easily make your own from partially submerging a sweet potato in water. And after a few day – it will begin to grow it’s own slips. One final note before getting on to planting instructions. Sweet potato vines (edible) are not the same as the ornamental sweet potato vines that are grown in pots, baskets and containers. While ornamental sweet potato vines will sometimes grow tubers or small potatoes – they are not in the least bit tasty! The best time to plant sweet potatoes is in late spring to early summer. When planting, sweet potato slips should be planted up to their top set of leaves. Although traditional potatoes are planted in early spring, sweet potatoes need a bit warmer soil. They are highly frost sensitive. Bury each slip in the soil all the way to the top set of leaves. Once planted, tamp the soil down around the top of each plant. Sweet potatoes need water to grow to proper size. Be sure to water plants at least twice a week if there is little rain. Once sweet potato vines begin to grow, they will suppress most weeds. It is a good idea to mulch plants early on. A bit of straw around each plant helps to conserve water and keep weeds at bay. Once the plants begin to grow – their massive leaf structure will suppress the majority of weeds. Sweet potatoes can begin to be harvested as soon as the plants begin to yellow. However, the longer they stay in the ground, they continue to develop additional flavor. You can partially harvest as well up until the threat of frost. This is a great method to take only what you will be using until you are ready for a full harvest. Sweet potatoes dug up and ready for the curing process. Sweet potatoes can store for a long time if kept in a cool, dark place. But they do need to be cured first. Curing is a simple process of letting the potatoes dry out completely before moving to long-term storage. In addition to preparing them for long-term storage, curing also aids in sweetening the potatoes up. To cure sweet potatoes, begin by gently brushing all of the soil off of the skins. Do this without water – they will store much better keeping without cleaning completely. Curing prepares the sweet potatoes for long term storage. Once brushed off, place in a well-ventilated but warm spot for about 10 to 15 days. A back porch, barn, or garage are all great places to cure. After the curing period, the sweet potatoes are then ready to take to a cool, dark spot to keep long-term. Be sure to save back a sweet potato or two to grow your own slips the next year!